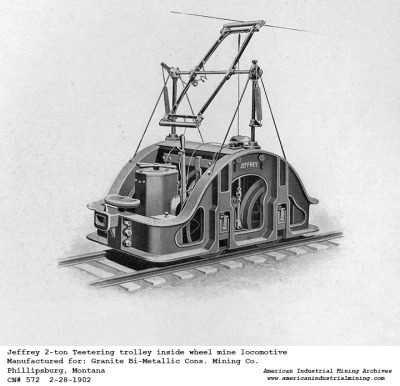 Jeffrey was the first American locomotive manufacture to build an electric locomotive to operate in an underground coal mine in 1888. 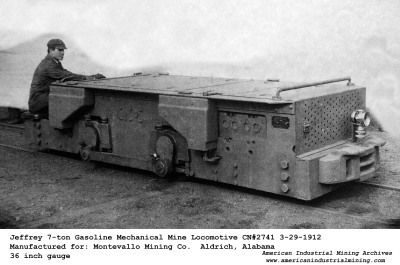 The early locomotives were primarily built of a cast frame construction then transitioning into an armor fabricated plate steel. Jeffrey Mfg. 's primary market was the coal mine industry. A large portion of the locomotives produced were trolley type electric locomotives. Jeffrey built their proprietary design of extremely reliable line of electric motors, electrical components, controllers, and even power plant substation equipment. The trolley type locomotives obtained the power from overhead wires generally manufactured as one of the 3 primary voltages 120, 250 and 500 VDC. As stated above the primary market was the coal mine industry. 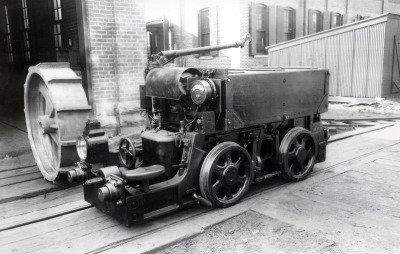 In 1900 Jeffrey produced their first storage battery locomotive that was a combination type. 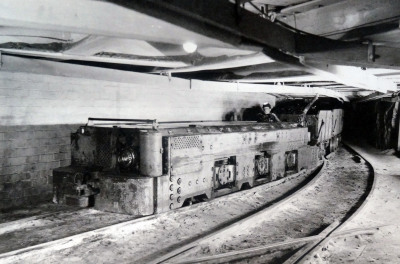 It was utilize the trolley system on the main haulage then switch to battery power near the working faces of the mine. Jeffrey attempted to enter the unique rack rail locomotive market for a very short time span. These locomotives would operate on a cog type railway but underground. Grades of 14% could be achieved with this design. 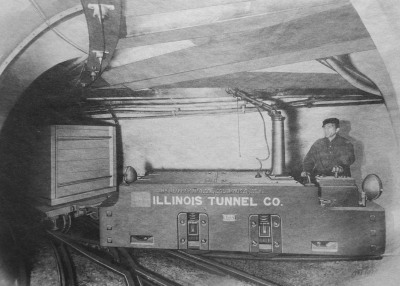 Only 2 sets were ever built around 1905. 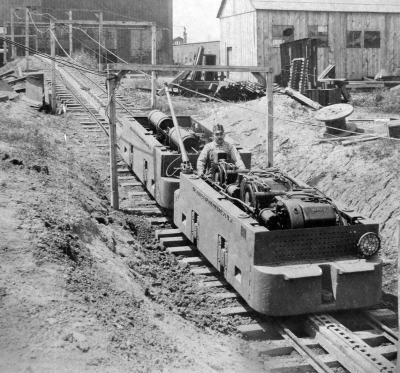 These extreme grade conditions possessed the dangers of mine car couplers breaking and "runaway" trains quickly made these systems obsolete. Keeping the rack rails clean of debri was another major obstacle that was difficult to maintain. Jeffrey built only 1 gasoline locomotive. Manufactured with a Davis Manufacturing Company 4 cylinder gasoline engine. Constructed in 1912 was a test to compete against other gasoline locomotive manufacturers entering into the industrial locomotive market. Electric locotives built for Industrial applications non-underground mine related. Jeffrey Locomotives were installed all over the world in steel mills, lumber yards, brick plants, quarries, shipping docks, foundries, smelters, undergound freight railways and industrial plants. The double truck locomotives were the largest units built by the Jeffrey Manufacturing Company ranging from 27 to 50 tons. Typically trolley and pantograph electric haulage locomotives. 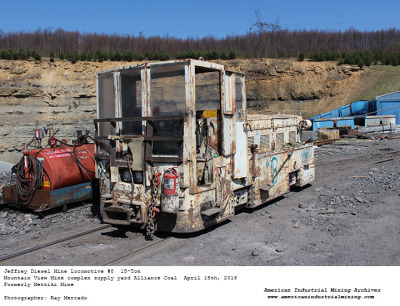 Shoemaker Mine located in Benwood, Wv was the last mine in North America for underground mainline coal haulage. 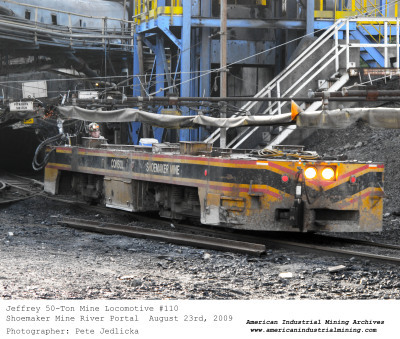 Jeffrey Mfg manufactured a line of diesel mine locomotives in the late 1970's into the mid 1980's. Equipped with Deutz diesel engines and a clark type 3 speed powershift transmissions. A fleet today remains in daily service .